Resident Evil: The Final Chapter is prefaced by a clip of Paul W.S. Anderson and Milla Jovovich, the series’ husband-and-wife, director-and-star duo, thanking their fans for supporting them and for coming out to the movies. In most cases, this kind of promo material plays as crass and unnecessary—movies don’t need to appeal to their audience’s goodwill when their audience is this built-in, as is the case for most franchise movies—but Anderson and Jovovich’s expressions of gratitude sound wholly sincere. They appear to genuinely care about Resident Evil’s fans, and about the story as more than just product. So consider Resident Evil: The Final Chapter a fond farewell from this longstanding saga of mutants, zombies, telekinetic asskicking and biohazards, an earnest love letter to moviegoers who helped keep the franchise on its feet for 15 years. That’s a hell of an accomplishment in a blockbusting era where Spider-Man gets rebooted after ten and Batman after just four, especially considering how bad reviews have been for each successive Resident Evil film since the first one opened back in 2002. Other studios might have just thrown in the towel, but Screen Gems sextupled down with Anderson and Jovovich, the latter frankly more integral to the success of Resident Evil’s big screen brand than her spouse. Anybody could direct these films, though perhaps not with Anderson’s exuberance. Only Jovovich could play Alice. 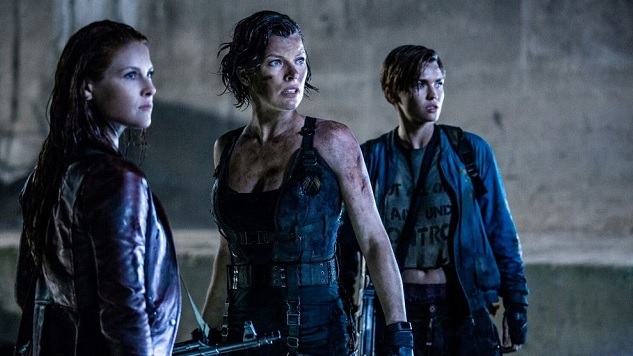 Jovovich’s vitality elevates Resident Evil: The Final Chapter above being just a retirement party for one of contemporary cinema’s most durable franchises. She’s so good at playing a somber badass that by now she could easily sleepwalk her way through these movies, but she’s managed to stay engaged with the material and with her role despite going through the same routine for a decade and a half. Kill monsters, gain superhuman powers, lose superhuman powers, die, regenerate, start again. Alice is so much a part of her DNA that the line between the actress and the character has irrevocably blurred. Resident Evil: The Final Chapter isn’t just Alice’s story. It’s their story—it begins with Anderson and Jovovich, it ends with Anderson and Jovovich, and there’s enough wiggle room in the final shot that if they ever feel like it, it can keep going with them, too. The film opens with a five minute intro and recap of what all has transpired throughout the last five Resident Evil movies before landing on D.C., where the most recent one, Resident Evil: Retribution left us off. We’re told that Alice’s foe-turned-ally, Albert Wesker (Shawn Roberts), betrayed her, and that only a handful of thousands of humans remain alive on Earth. We’re also told that there’s a way to stop all this madness: an antivirus to the T-virus, the virulent plague that kicked off Resident Evil’s interminable apocalypse in the first place. In short order it comes down to Alice to retrieve the T-virus from the clutches of Dr. Alexander Isaacs (Iain Glen) and thus save mankind from extinction, but only after she fights a horde of shambling corpses, undead dogs, and other nameless horrors. Anderson isn’t a very disciplined filmmaker, but he does have a better sense of how film and videogames intersect as mediums than most, and that works in Resident Evil: The Final Chapter’s favor. There’s a casual attitude to the way Anderson approaches writing, as though he considers dialogue and plot obstacles to the real meat of Resident Evil as an action-horror hybrid: watching Jovovich go toe-to-toe with hulking abominations or take out squads of assassins in fight scenes lifted right out of The Book of Eli. You could build a drinking game around the number of times someone says, “Damn you” or “Get out of there” or “Behind you,” though make sure to have emergency services on speed dial if you do. This is how you give your diehard fans a good send-off: You lean in on the premise of your action-horror videogame adaptation bonanza and give the goods as often as possible, throwing an onslaught of noise at the screen with zeal until the final credits roll. You’ll see better-made action movies in 2017, and you’ll see better-made horror movies in 2017, but you may not see movies of either stripe made with Jovovich and Anderson’s level of heartfelt devotion. Boston-based critic Andy Crump has been writing about film online since 2009, and has been contributing to Paste Magazine since 2013. He writes additional words for Movie Mezzanine, The Playlist and Birth. Movies. Death., and is a member of the Online Film Critics Society and the Boston Online Film Critics Association. You can follow him on Twitter and find his collected writing at his personal blog. He is composed of roughly 65% craft beer.